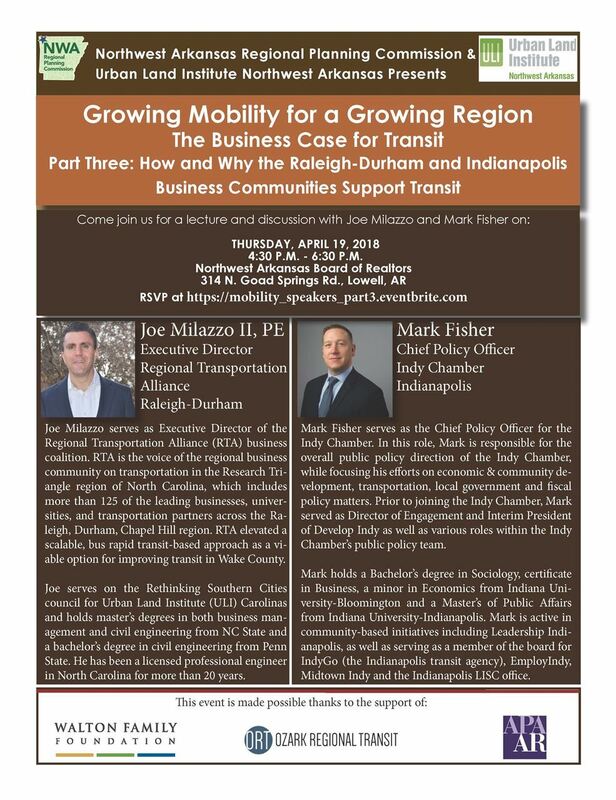 NWARPC has partnered with the Northwest Arkansas Urban Land Institute for this event and will feature Joe Milazzo II, PE Executive Director Regional Transportation Alliance Raleigh-Durham and Mark Fisher Chief Policy Officer Indy Chamber Indianapolis. Both speakers have been instrumental on the business/chamber side to improve mobility in both regions. Joe Milazzo serves as Executive Director of the Regional Transportation Alliance (RTA) business coalition. RTA is the voice of the regional business community on transportation in the Research Triangle region of North Carolina, which includes more than 125 of the leading businesses, universities, and transportation partners across the Raleigh, Durham, Chapel Hill region. RTA elevated a scalable, bus rapid transit-based approach as a viable option for improving transit in Wake County. Joe serves on the Rethinking Southern Cities council for Urban Land Institute (ULI) Carolinas and holds master’s degrees in both business management and civil engineering from NC State and a bachelor’s degree in civil engineering from Penn State. He has been a licensed professional engineer in North Carolina for more than 20 years. Mark Fisher serves as the Chief Policy Officer for the Indy Chamber. In this role, Mark is responsible for the overall public policy direction of the Indy Chamber, while focusing his efforts on economic & community development, transportation, local government and fiscal policy matters. Prior to joining the Indy Chamber, Mark served as Director of Engagement and Interim President of Develop Indy as well as various roles within the Indy Chamber’s public policy team. Mark holds a Bachelor’s degree in Sociology, certificate in Business, a minor in Economics from Indiana University-Bloomington and a Master’s of Public Affairs from Indiana University-Indianapolis. Mark is active in community-based initiatives including Leadership Indianapolis, as well as serving as a member of the board for IndyGo (the Indianapolis transit agency), EmployIndy, Midtown Indy and the Indianapolis LISC office.